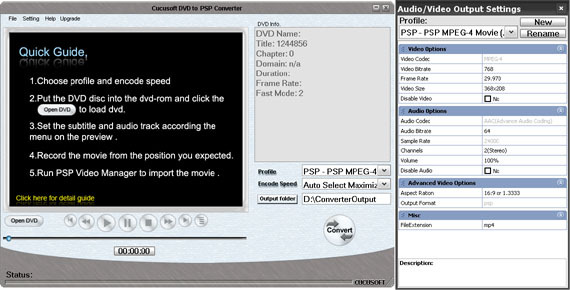 Cucusoft DVD to PSP Converter is the easiest to use DVD to PSP converter software you can find in the internet. It can convert almost any type of DVD to play on a PSP Video player. Since it directly converts your DVD to PSP format, it is by far the fastest and most powerful PSP converter tool in the market. Now, your PSP is no longer just a gaming device but a portable DVD player as well because after using Cucusoft DVD to PSP Converter, you can instantly watch and enjoy your favorite DVDs anytime and anywhere. To top it all, you can own this amazing software at a very affordable price too! --Allows you to modify the output file size and corresponding video quality. --You can crop your video to 16:9, 4:3, full screen and more. --You have an option to split your output video by DVD chapters and titles. --You can easily customize the various video settings such as brightness, bit rate and more. --No monthly or annual subscription fees and no hidden charges for software updates making it indeed a wise purchase. Can support any video DVD disc that can be played on your PC/DVD player properly.